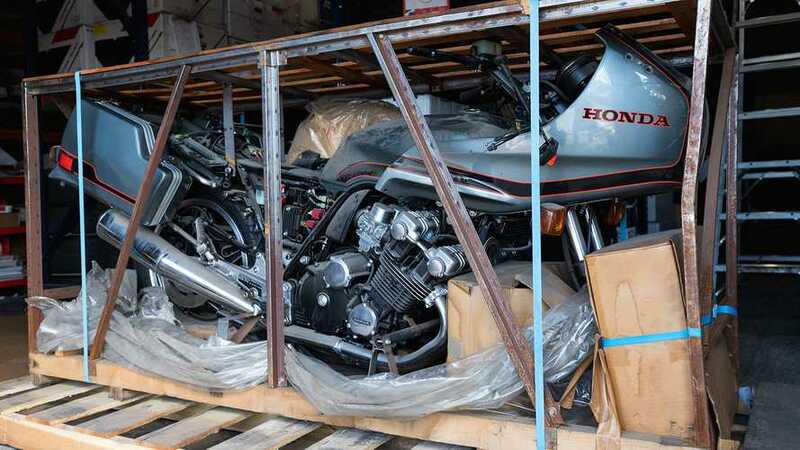 You may or may not remember that superb, mint-condition 1981 Honda CBX-B found in a crate late last year. The bike had originally been shipped to an Illinois dealer and left for almost three decades in its original box—reminds you of never-opened collectibles toys right? The bike was auctioned off in November and a dealer bought it for $28,000. Guess what? The bike showed up on an auction site once more and found a new owner. Bonus: this time we have an entire gallery of pictures to enjoy! Already back in November, everyone got pretty excited about this CB in perfect condition found in its original crate. With the counter showing only 1.8 miles and a thick layer of dust showing the passing of the years since it was first crated and shipped, the Honda quickly found a new home at a dealership in Florida. The blooming love didn’t last long—after only five months, the very same CBX-B popped back up on Bring A Trailer—the new owner decided to part with the bike, still in its crate. Like an old friend who hadn’t visited for a while, we were happy the CBX-B dropped by to say hi on its way to a new owner, which also allowed us to have a good look around. This time, the bike auctioned off for $20,600 on April 5—plus a $799 document fee on top. The winner of the bid and new owner of the mint CB commented that he plans on leaving the bike in its crate—a polarizing decision, applauded by some, questioned by others. I mean, who wouldn’t be curious to fire up this old transversal inline six? The former flagship never got the full recognition it deserved, outshined by the CB900F. The quirky 1,047cc six of the 600 pounder received great reviews, but it wasn't enough to get people to actually buy it. It had a very short three-year run on the market in the late 70s, early 80s. According to our earlier report of when the bike was originally found, it was suggested the forgotten crate possibly dropped off the radar of a technical school. As Justin explained in his original article, a number of CBX-B were donated for future mechanics to work and learn on. Because they were so advanced for the time, it is believed some were never used and were left to be forgotten. We hope the new owner will truly take full advantage of his rare find now. Or maybe it will show up on BAT once again before the end of the year?